It’s a cliché that one of the best parts of summer is the fresh produce, but it also happens to be true. We had planned to visit a nearby village to get some post-dinner ice cream, but decided to kill some time and amble down a different road. We should have known we were headed for something special when we passed this scene, just a few feet from the car. As we passed through a small string of tiny villages, we got the sense that we might be in for a treat. 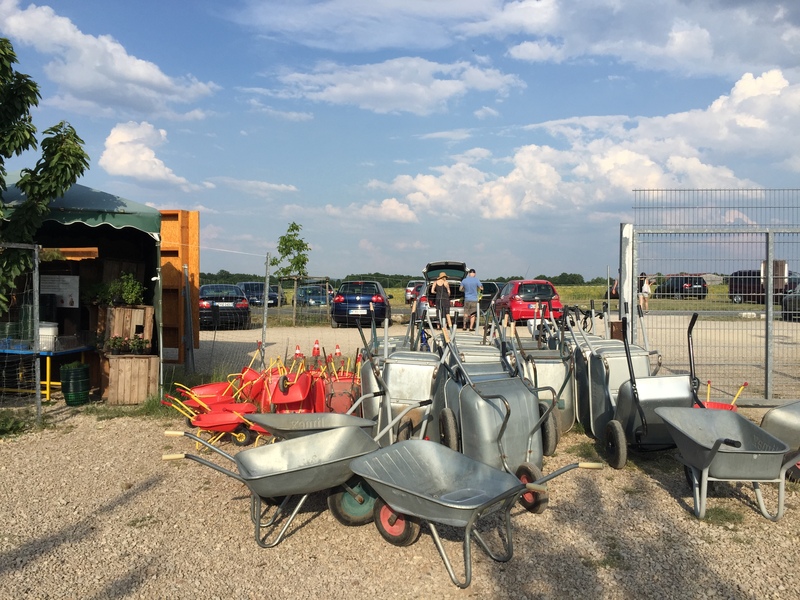 And there it was: Rising out of the corn and wheat fields, a clearing with picnic tables, play tractors, hay bales, a small store and acres of produce. 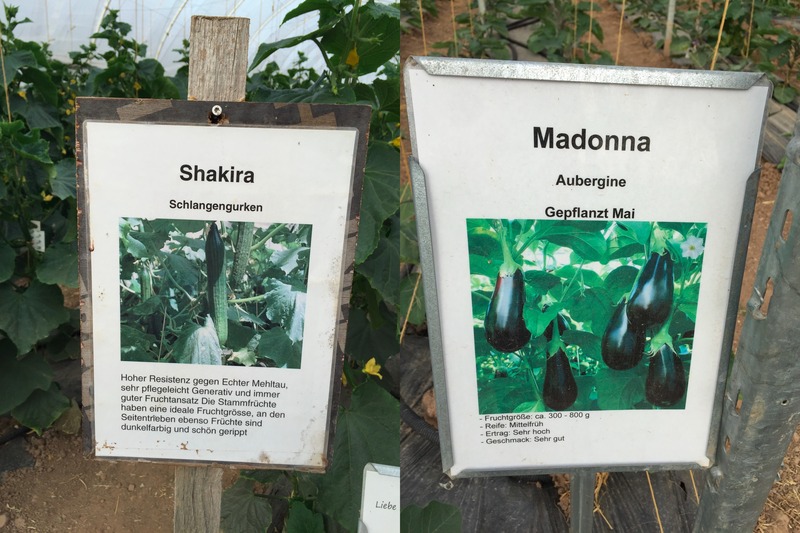 The Neidermann farm of pick-your-own produce! The store was our first stop and it was sensory overload in the most wonderful way. 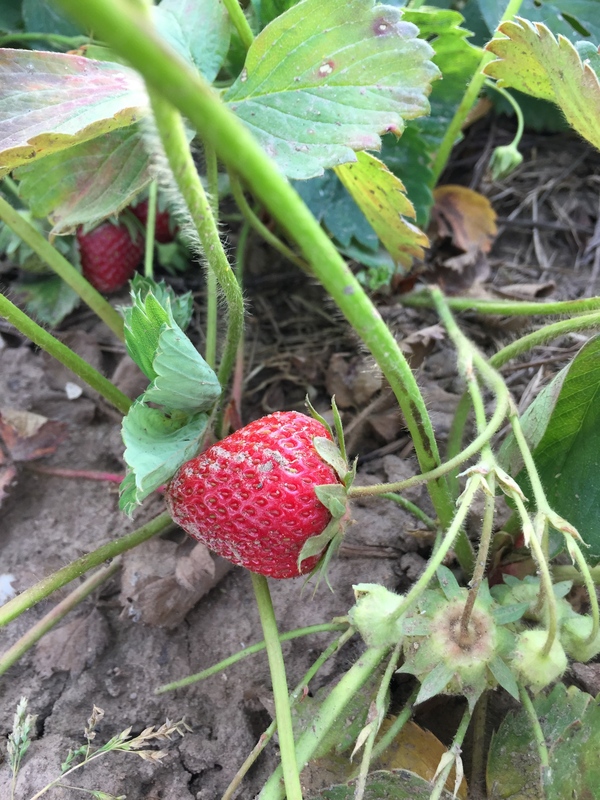 Literally bursting with fresh produce and baked goods, the smell of fresh strawberries permeated the air. 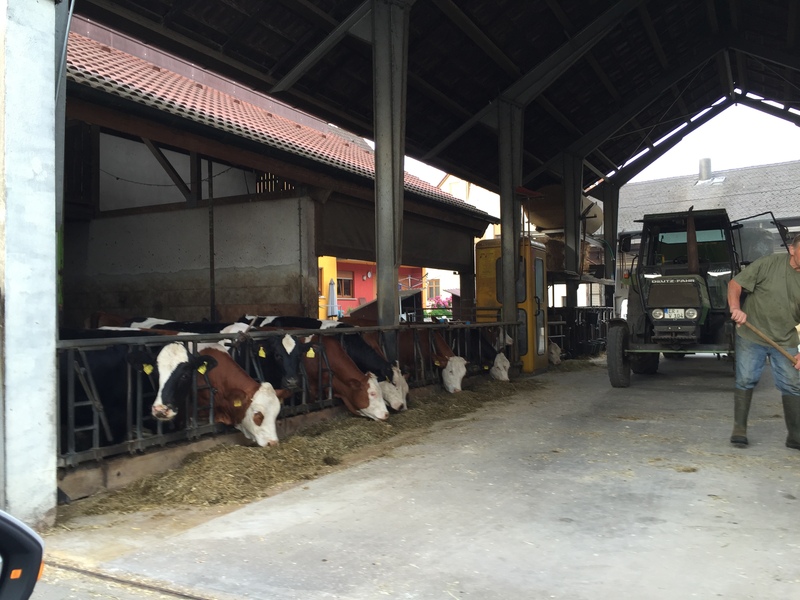 Customers were lined up with buckets and containers full of their just-picked choices. We bought some ice cream and sorbet and scouted the area. 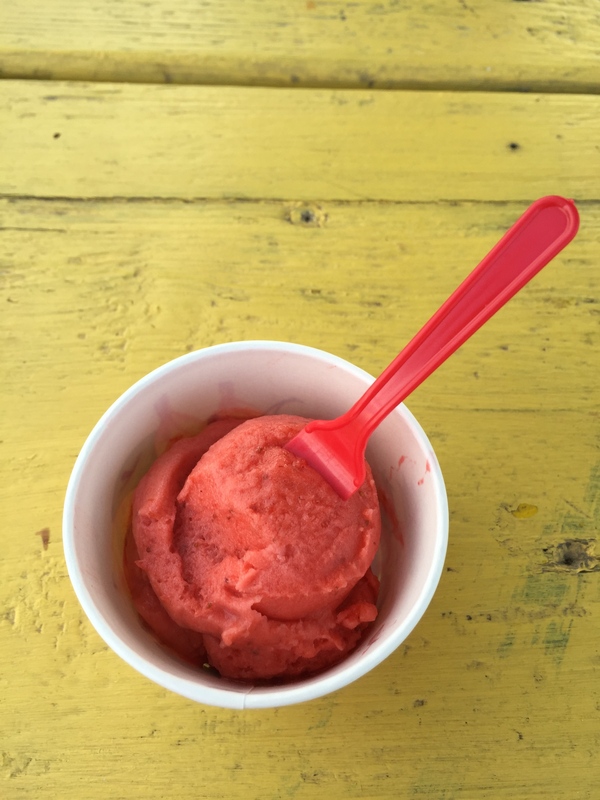 Sorbet made with fresh-picked strawberries? Yes please! 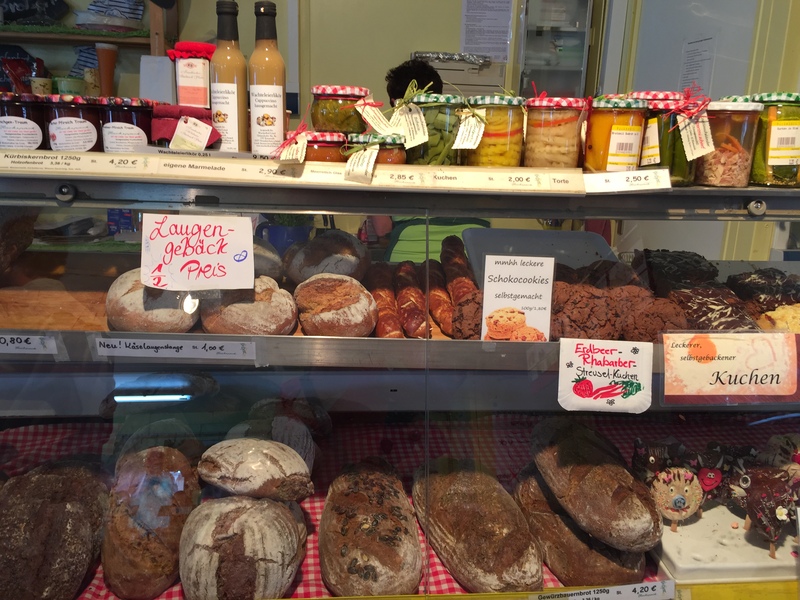 Fresh bread and home-made goodness. So hard to choose…. Around back were signs directing you to all the fruits and vegetables that were ready to be picked. The evening we were there the strawberries, lettuces, garlic, mini-cucumbers, radishes, and rhubarb were ready. They even had a chicken coop so you could gather your own fresh eggs! Grab a wheelbarrow and head out to the field! I expect a mid-summer dance-off between these vegetable divas. Next to the farm store was a park-like area filled with families enjoying picnics and playing games. 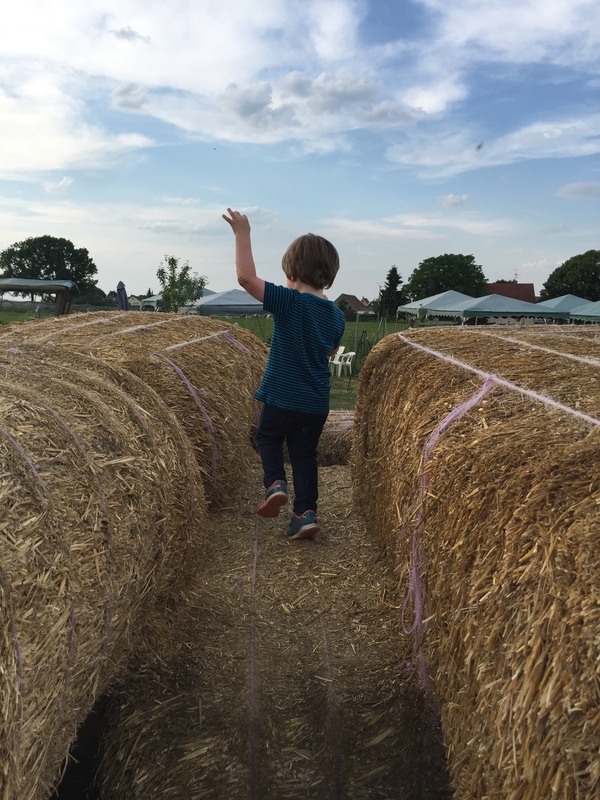 There was a petting zoo, a fort of stacked hay bales to climb on, a corn crib to play in and open space for soccer and general running around. King of the hay-bale castle. As expected we needed a large box to bring home everything we bought. But in this case, our eyes were not bigger than our stomachs. When it comes to fresh berries and cherries, gluttony is the only option. 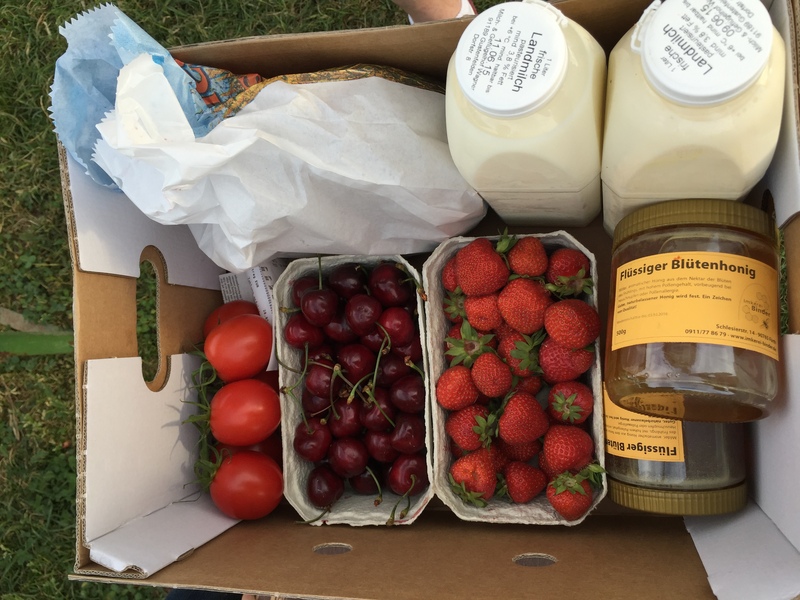 Our take-home box included berries, cherries, honey, walnut bread, tomatoes and fresh milk.